Snack Girl can’t stop talking about fall. Perhaps, it is because she is swimming in falling leaves. Where I live in New England, this is the time of year we all are entranced. As I walk or drive, these beautiful colored leaves float down from the sky as if I am a bride with rose petals being tossed my way. The light through the yellow, red, and green leaves looks like I am in an outdoor cathedral with the most thrilling stained glass. Now, I am done with my spurt of creative writing that is probably causing all of you pain. Vegetables are not as fun to write about as fall leaves but some good ones are here right now. You got Brussels sprouts, sweet potato, and carrot all in your Farmer’s markets and grocery stores. In this recipe, I mix them with quinoa, the grain everyone loves because of its high percentage of protein. I only like quinoa when it is mixed with lots of other things, otherwise I think it tastes like dirt (sorry quinoa lovers). The dressing here is optional because you may find that you don’t need it. There are many flavors here and I found that it tasted great without anything added. Some of you may find it too bland. That is what is SO fun about cooking, you make it your own. Anyone else psyched about fall leaves? Preheat oven to 400 F. Line 2 rimmed baking sheet with aluminum foil and toss sweet potato, Brussels sprouts, and carrots with the olive oil on the sheets. Spread them out in a single layer and then sprinkle with salt. Roast for 20 minutes or until vegetables are soft enough for your taste. While the vegetables are roasting, make the quinoa using the package directions. 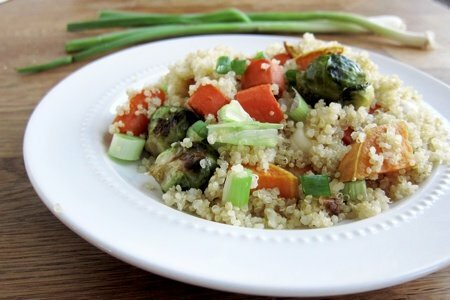 In a large bowl mix together the roasted vegetables, quinoa, scallions and cilantro. Taste and decide if it needs homemade salad dressing or is delicious all on its own. While I usually dread the start of Fall (since it means that Summer is over) by this time I fully embrace it (and start to dread the approaching Winter). I too live in New England and love the changing colors of the leaves. I also love all the Fall vegetables now in the grocery store and wish I knew how to prepare them myself. I will definitely give this recipe a try and perhaps even add the butternut squash that has been sitting on my counter for over a week. I love throwing quinoa and veggies together. I make a big batch and eat all week long for lunch. I LOVE Quinoa. actually, Ifor this recipe, you could roast the sweet potatoes with about 10-20 min then cook it and the other veggies with the quinoa. it would add so muc mor flavor! My family are not fans of cilantro. Anyone have an alternate suggestion? Regina, I agree. Cilantro is the devil. Leave it out or sub Italian Parsley. I usually just leave it out. I LOVE LOVE LOVE fall. The colors are so darn gorgeous. I especially love foggy/cloudy fall days because it seems to give the colors more POP! I envy those of you that live in the Northeast. I am wanting to take a trip out that way specifically for the fall colors. As for the featured dish the veggies look yummy but truth be told I am a bit frightened, standoffish about the quinoa. I know it is extremely healthy but it doesn't sound appealing to me. I just need to buck up and make it. Maybe I will try this recipe. Can't wait to get home and make this! I love quinoa as it is GF and versitile. Thanks: I hate cilantro, so glad someone gave a suitable substitution! You could use cubed butternut squash in this recipe I bet; bake it 30 min alone first. This is my new go-to dinner...I make a big bowl of quinoa and add whatever vegetables look good in the store and eat it throughout the week for lunch and/or dinner. I also add feta cheese for added protein. When I add tomatoes I always cut them (even grape tomatoes) as the juices add to the dressing. Speaking of dressing...I take a little bit of Tahini sauce and mix in water.. drizzle over the top and it makes the meal so decadent! !